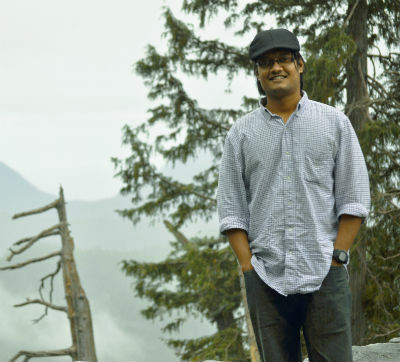 Allow me to introduce Sriram Ramakrishnan, a software engineer by profession and an author by passion who love to explore the world and different cultures. Importantly he loves putting in efforts to get answers to the questions. It is very important to seek the truth and meaning behind the things we come in contact with. Only a person with an open mind can try to seek the purpose of the life. Usually, balancing the life between a modern world with unending material requirements and inner peace of the mind and heart. After reading the book, we got curious to know more about Sriram and his journey. And, what could be a better alternative than having an author interview with him? Fortunately, the things worked out and from our team, I got a chance to have a Q/A session with him. We like your book very much and enjoyed reading it. We are glad to have a conversation with you. As your book is getting both commercial success and critical acclaim gradually, I can see the flow is started, and obviously, you are enjoying it. Can you share your feelings? I am glad you enjoyed the book, and hope others will enjoy it too. Thanks for giving me this interview opportunity. When I published my book, I was surprised by the reaction of many people. Some of the reviews were, “gave me goosebumps”, “inspirational”, “astonishingly good story-telling” etc. I have read many book reviews, but rarely seen those superlative words used in reviews. They sounded genuine and heartfelt to me. I feel happy that people find it inspiring. Marketing the book is indeed a challenge, and I hope the book will reach more people. I realized that feeling complete has no relation to fulfilling passion or dreams. Because the moment I feel, “incomplete without something else”, right there, I have lost my happiness. We are on a long train journey called life, people get on and off, passions appear and disappear, some desires may get fulfilled, some may not. I believe we have to look within and realize that the journey itself is the completion, with all its joy, sorrows, adventures, heartbreaks, love, hurt, health and sickness. Can you tell us more about yourself, your background, your profession and your passions? 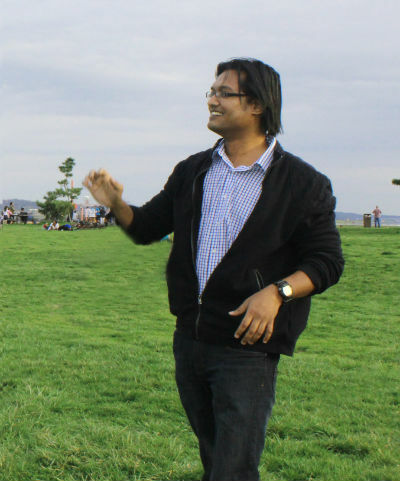 I am from Chennai and have a computer science engineering degree. I am a software engineer by profession. My passions kept changing. From my school days when my passion was to get into a top-notch college, to get into a top-notch software company, to study in the US. Through life’s experiences, I slowed down and started looking deeper within. I wouldn’t call it a passion, but I love traveling, meditation and yoga as they take me deep within. I also love to write. My life’s experiences and the willingness to share them. I myself learned a lot from reading other’s memoirs and adventures. I hope the book will inspire some people to look deep within and realize that our happiness is sitting right inside us all along while we were busy looking for it outside. I wrote the book while also working, so finding time to write was a bit of a challenge. Since it’s a memoir, I wrote a lot more pages, but was a challenge to edit, didn’t know what would be interesting, what would be boring, what would be relevant/irrelevant to the flow etc. The first chapter I started in the book was my experience with Madhuri in the University in US (“Chapter 4 – Crush”). I often write many experiences and share it with my friends. The response I got for my experience with Madhuri was, “It was so deep, reading that gave a pit in the stomach”. I didn’t realize my writing could affect someone that much. That’s the inspiration for the book and the first chapter I wrote. I weaved the book forward and backward from that chapter. I would say both. If I suddenly get some ideas, I sometimes sit in a corner, take out my cell phone and write it down. Sometimes I hold that thought, sit in front of my computer and write it methodically. I designed the cover myself. I pictured that cover first in my mind, and designed it with photoshop. Can you share your experience of the journey from writing the book to getting it published? I like writing and share my travel and life experiences with friends. When I got a heartfelt response, I started writing the book. I completed the book in 2013, but suddenly thought who would want to read my memoir? I am not a business mogul or a celebrity. Also, editing the book became a little time-consuming as I had written a lot of pages. At one point I got busy with my job and the book was sitting in my hard disk. I eventually edited and decided to self-publish in July 2018. I realized many people are finding it inspiring and liking it. I am now trying to see how I can market it, so more people will be able to enjoy it. Can you tell us that how much of the book is inspired from your real life? 🙂 It’s my memoir. The whole book is from my life. I changed some names and places to protect privacy of individuals. And changed some chronology of events to maintain the flow. Other than that, the events are real. We all get inspired by the people living around us and incidents happening around us. Writers take a lot of inspiration from these realities and then mix it with fantasies. While writing mythology there is not much scope, however, a lot of imagination has to be weaved in the tale, Can you share any of real incidents which helped you in writing this book? 🙂 As mentioned earlier, the whole book is inspired from real incidents in my life. And my willingness to write and share my experiences with others resulted in this book. Every book affects its author in some way. How do you think writing Chennai to Chicago affected you. I like the fact that, my experiences are now reaching beyond my friend’s circle and people are liking it. It hasn’t affected me in any particular way, but I hope more people will be able to read the book and get inspired to at least spend few minutes contemplating on, “what is life”, “what is the purpose”, “what’s the whole point” etc. 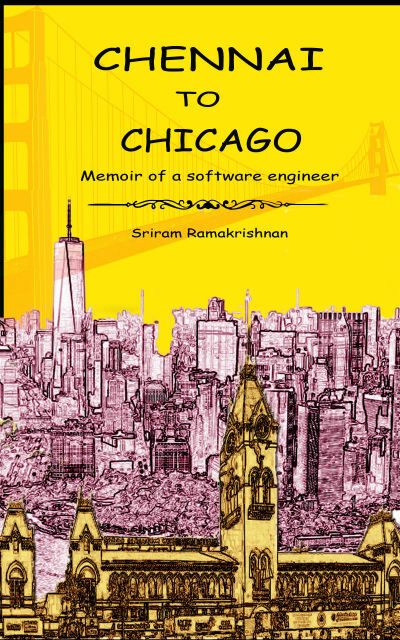 Why one should read “Chennai To Chicago” according to you? I am hoping my book will make people look within and think deeper. Memoir, especially spiritual, soul-searching memoirs. I used to read John Grisham, Michael Crichton, Ken Follet, Dan Brown and many other fiction authors in my early twenties. Slowly I lost interest in fiction and started reading non-fiction and memoirs. I became more interested in learning from people’s lives and real experiences. I don’t particularly favor any author, but some non-fictions I loved reading are – Three cups of tea by Greg Mortenson, Into Thin Air by John Krakauer, The Journey Home by Radhanath Swami, The Surrender Experiment by Michael Singer. I just finished reading, Chants of a Lifetime by Krishna Das. I like riding motorcycle, going on long drives in my car through the mountains and deserts, and of course, traveling. I read somewhere that, if every citizen in Bangladesh becomes as rich and capable as a middle-class German, the world will have food crisis in 10 years. In other words, rich people can afford to be lavish in the world because poor people are being deprived. We eat 3 meals a day because someone in Africa is dying of hunger. We have to understand that the resources are limited. If someone’s getting more, then someone else has to get less. Some of the Western countries are neat and clean because they dump their plastic wastes in the ocean (and some wastes are being shipped in containers to India as well). If everyone becomes rich in the world, there will be famine and wars for food and water. Suppose a cake is kept in front of us, and it has to be shared by 100 people. This is how the world today works – 1 person gets to bite half the cake for himself, another 10 people share half of what’s left, another 20 people share half of what’s left from that, and the remaining meager portion is shared by 70% of the world. The management jargons being used today, like, “be aggressive”, “be a go-getter” are polished ways of saying, “grab your bite, to heck with the rest”. I believe the world is sweeping trash under the rug. Days are not too far when everything will blow up right back in our face. The only way to preserve nature is to not be greedy and use a little bit of common sense. You’ve talked about various cultures and way of living across the globe in the book, can you share some similarities and something very unique to a specific culture, which you find interesting? There’s a town in the Nebraska state in the US, where people driving on the road greet each other from inside their vehicles, whether it’s a car or a truck. First I was a little confused, when every car passing by waved their hands and greeted me. I later read that it’s their culture, and I too started waving at them. In Australia, they call trash as “rubbish”. It kind of sounded funny, especially some trash cans had this written on them, “rubbish here”. And of course, “Adithi Devo Bhava” is unique only to India. You will be surprised how much love random people just shower on you. Though I love reading a paperback, the convenience that an e-book gives is unbeatable. Especially during backpacking when every ounce starts putting weight on our shoulders after a while. I believe eBooks are good, especially for the present tablet-mobile generation. I love both. But prefer e-books for convenience, especially during backpacking / traveling. What is the one thing you want to share regarding time management? I think we should do what we love. The word “time management” is a 21st century jargon. When I was a student, I went to school / college, studied, may be attended some extra classes / games. Then I went to the University, then started working, traveled to more than 18 countries, worked in 4 different countries. I never really managed time, just lived from my heart. And I haven’t missed out on anything, doing just fine. There’s a saying, in the present day, people spend half their life gaining wealth and losing health, and spend the other half losing the wealth to gain back the health. My grandparents weren’t around, they passed away when I was very young. But, more than stories, I learned / still learning a lot from the way my mother lives. She’s a very strong and kind woman, an epitome of patience, with an extremely positive and cheerful attitude. I definitely feel the tradition is gradually deteriorating. How many of us know that some of the month names are retained from Sanskrit? “September”, is derived from “Saptha Ambar”, meaning 7th sky. “October” is “Ashta Ambar”, meaning 8th sky (“Octo” means 8 in Greek as well). “November” is “Nava ambar”, 9th sky. And “December” is “Dasa Ambar”, 10th sky. Most Indian New Years, including Ugadhi, Vishu, Gudhi Padwa, Tamil New Year, all start in the months of March / April. When counted from March, September becomes 7th month, December becomes 10th month. Through centuries, some of the Indian month names were retained, but the New Year’s Day was moved to Jan 1st. Calling September as 9th month, December as 12th month are misnomers. And there are some historical accounts, where the “April Fool’s Day” was coined to discredit people who celebrate New Year’s during the months of March / April and not Jan 1st. That way, it’s funny that Indians celebrating April Fool’s Day is akin to calling ourselves fools. Anyways, today, I feel kids are more interested in immersing themselves in cartoons and iPad games. Not sure if they will have patience to sit and listen to stories. Social media is a double-edged sword. It can be effectively used to spread awareness, or, spread lies for that matter. Many people today are heavily opinionated. And late-teens and young adults are becoming too quick to judge and be swayed by what’s trending on Facebook or Twitter, than what they truly believe in their heart. A bloody face of a child (even if it’s photoshopped) is enough to instigate intense anger in youngsters. This is being used effectively by corporate / anti-corporate / political / anti-political elements to sway people’s opinions either way. Today, news and ideas float like bubbles in the air for few days and burst into nothing. It is every individual’s responsibility to use common-sense, investigate, and confirm the veracity of whatever is being shared. I am actually curious to see what would happen to social media if the “like” and “comment” buttons are removed. Would people still be posting messages, photos and videos? Or is it the “likes”, a.k.a, “temporary fame”, the actual motivator for social media? Too many bubbles bursting too soon in life only create more depressed youngsters. Don’t hurt yourself. Don’t hurt others. With these two rules, do whatever you want in life.